Ward's Island is a world unto itself. It is close to downtown, yet removed. It is dense, yet open. It is cottage country in the heart of Canada's biggest city. Technically, "Ward's Island" does not exist. You can take the ferry to the Ward's Island ferry dock. You can walk there from Centreville Amusement Park. You can see it from Cherry Beach or Leslie Spit. But there is no such place as Ward's Island. Ward's "Island" is actually the easternmost part of Centre Island, the curve of land that hugs Toronto Harbour. It is part of the Toronto Islands, but it has a character and an atmosphere all its own. Back in the late 1880s, David Ward and his seven children built a hotel on the newly-formed Centre Island. A small tent and resort community developed around them, followed by a residential community. Most of the people who live on the Toronto Islands today live on the eastern edge, in the Ward's or Algonquin Island neighbourhoods. The beach itself is a very short walk down Withrow Street from the ferry dock. Do yourself a favour, though, and take the long route. To get to Ward's beach, you should stroll through this tranquil, car-free residential community. It is a privileged community, because it is special, but household incomes are below the city average. The "roads" are designed for pedestrians, creating a quaint, close-knit vibe. The result is unpretentious yet impressive. When you do arrive at the beach, it will not be deserted but it should be quiet. 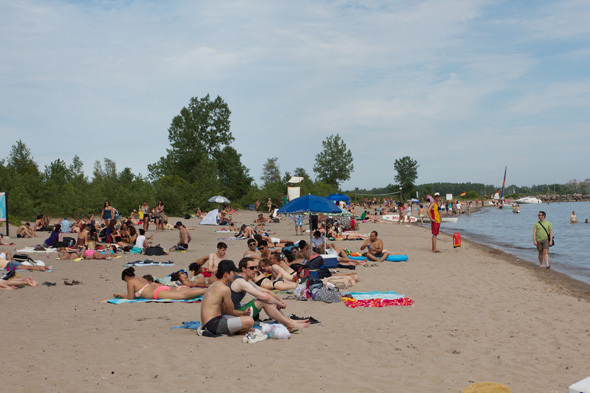 Beach users are a mix of island residents and in-the-know island visitors who come to escape the crowds of Centre Island. Boaters tend to anchor just offshore on their way in and out of the harbour. Despite the ferry ride and the stroll across the island, you end up only a few hundred metres from the Leslie Street Spit, Cherry Beach, and the entrance to Toronto's Outer Harbour across the gap. Water quality at Ward's Beach is good. It is a bit rocky, especially at the west end. Die-hard sand lovers will prefer Gibraltar and Hanlan's beaches to the west, where the strong wave action keeps things soft and algae-free. The charm of the Ward's community and the relatively clean water still make this beach very attractive in its own right. 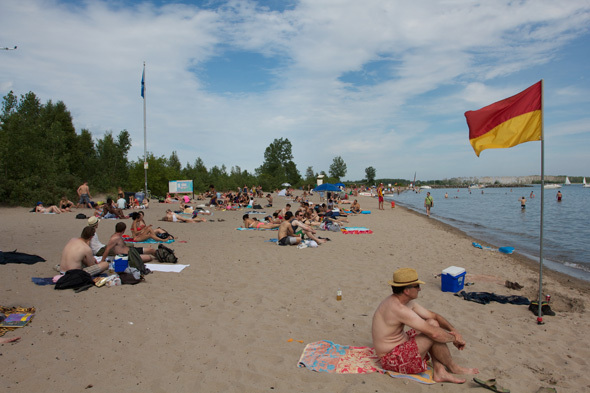 Ward's Beach is part of Centre Island, yet it is its own place. Instead of amusement parks, you'll find a disc golf course. Instead of pizza and ice cream from summertime vendors, you'll find bresoala and wine at the Rectory CafĂŠ. When you visit Ward's - and you definitely want to visit Ward's - you're playing in a not-so-secret backyard treasure. 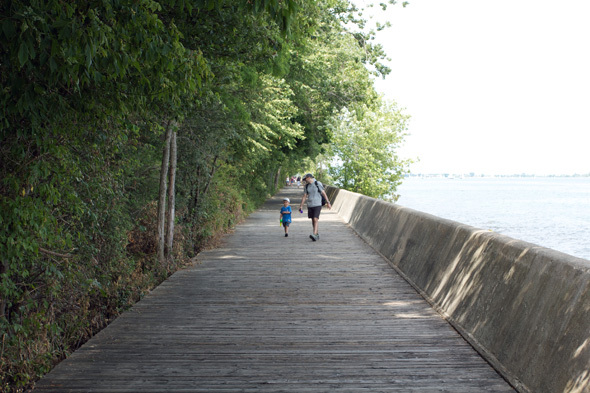 If you are on bike or on foot, follow the boardwalk from Ward's Beach 3-kilometres to Centre Island or 4.5-kilometres to Hanlan's Point before heading back to the mainland. Aggressiveness of seagulls and geese (out of 3): 1 (historically the Island birds are very aggressive and messy, but due to the bird relocation program, there aren't many to bother you right now).